If you’ve recently started or completed a kitchen design or renovation, you’ll know first-hand, that there are so many decisions to be made. Generally, we all start off with the biggest decisions, what style of kitchen we want. Then we start breaking it down to colour, benchtops, cabinetry, appliances, flooring and so on.But one of the most commonly overlooked items in the decision-making process, is your kitchen sink.Which is kind of strange, because when you think about it, the kitchen sink is one of the most used items not only in your kitchen, but within your whole home. So, doesn’t it make sense to take the extra time upfront to consider this important piece of your reno or design? With so many options of kitchen sink’s now available, it is easy to get weighed down with the pressure of finding the perfect match. 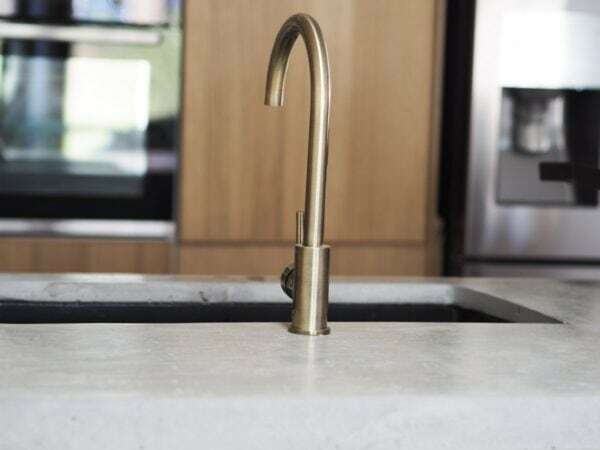 Not only do you need to consider the material, colour and size, you must also consider how you would like your sink to be installed, to complete your overall look. Some things to consider before you even start looking for your new sink, is the size. I think this is the critical part of your choice. If you are a couple or you live alone, maybe you don’t feel the need for a large double sink with drainer anymore. In this instance, the single bowl kitchen sink is the perfect option for you. This will free up valuable bench space, while still being function and it won’t limit your options of sinks that are avail-able. Try a smaller format single bowl kitchen sink, which still allows for either mounting option or maybe you’re a family that really needs that extra functionality that a large sink brings. Maybe there’s a cook in the house that needs that big deep double bowl sink to fill large pots with water to make a big bowl of pasta for dinner! • Size – as I mentioned earlier, I feel this is the most important and first part of your decision. Try and picture yourself using the sink every day, does it feel functional for you? • Availability – while you might find your perfect kitchen sink online, it’s in Spain with a 6 weekdelivery time! Try and think about these sort of time constraints, the returns policy and any warranty guidelines that may not cover you outside of that country. So now that we have some of the practical decisions out of the way, lets talk about the fun stuff! If you’re anything like me, you could spend days searching the internet and kitchen showrooms looking for your perfect piece. But like so many of us nowadays, we’re all so busy – So I’m going to try and narrow down the hard work for you.No matter what your style, we’ll be taking a closer look at some of the current trends, while still not forgetting about the classics either. Let’s start off with an oldie, but a goodie…Let’s visit the classic stainless steel sink. A staple in many homes around Australia, you probably had this style of sink growing up, and like me, you still have one in your current kitchen. There is a reason why the stainless steel double sink with drainer, in particular, has been so popular for so long..
It’s large enough to pile in the dirty dishes, put your hot pots on the drainer while you’re dishing up dinner, and then quickly rise off your plates in the second bowl when you need to pack the dishwasher. So, try and take a minute to now think about your current sink. Is it ticking all your boxes with regards to size, functionality, cleaning? If you are still happy with your double sink with drainer, keep it the same. Or maybe just opt for something a little different, like a gunmetal grey colour, to tie in with a more modern version of the classic. An excitingnewtrend we are seeing more and more, is the emergence of Butler’s Pantries. With a separate space for preparing food, storing appliances like coffee machines and microwaves, it’s about space, but it’s also about having that extra sink to stowaway dirty dishes! Because this space is relatively ‘hidden’ away, that doesn’t mean that you can’t still have what you want. If you’re not going bold in your main kitchen, maybe the Butler pantry is your chance. I think that this is the perfect space to experiment. Go large and bold with a black or dark grey double sink, black fixtures and black appliances. Maybe you’re leaning towards a more classic stainless steel look, or a pretty vintage vibe with rose gold features.While it may seem extravagant, and another kitchen to maintain, the advantages of having a butler’s pantry and a butler sink are many…Imagine being able to prepare for a family dinner or party all in one space, and simply being able to close the door on any mess, pour yourself a nice cool drink, and wait for your guests to arrive. We’ve come along way since the 17th century when the original Farmhouse Sink was conceived. Created out of necessity, its only function was to hold large amounts of water in the home that were carried in from pales collected from nearby wells. Thankfully, we don’t have to worry about carrying water into our homes, but the basic principle is still the same to this day. I normally think about an English cottage somewhere in the countryside when I hear Farmhouse kitchen, but there is no denying that the interest in the English and American-style Farmhouse sink, also appears to be growing in popularity. Picture a large porcelain, rustic copper, or even a more modern brass sink being the focal point of your gorgeous new kitchen. These sinks are versatile, yet also make a statement! We are expecting more and more from the things we buy these days. We are multi-taskers, and therefore need our products to be multi-functional. With their large format, you will be amazed at what you can use this type of sink for. Not just relegated to washing dirty dishes, large pots and pans – channel the American way of life and give your little ones their evening bath in there! Just be sure to wash it with anti-bacterial solution before and after you put bub in!! There are a few things to consider with this style of sink though, water consumption being one. They do take a little more water to fill, however, I think the generous size will compliment many styles of Aussie kitchens. There are more and more options for this style of sink heading our way, so keep an eye out, if this style is for you. If you are anything like me though, I really want to renovate my kitchen, just so I can get a copper kitchen sink! 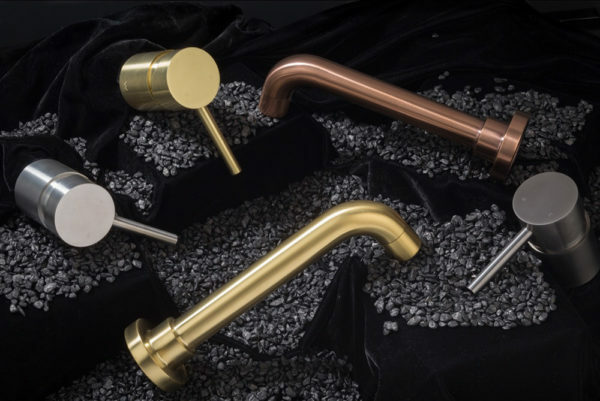 You can’t help but fall in love with the shimmering beauty of a copper coloured sink, and it also helps that they are bang on trend in 2019. I know what you’re thinking, ‘isn’t this a bit showy for my house?’ The simple answer is no! Until recently, our only real option for a kitchen sink was stainless steel, white porcelain or acrylic. We are so exceptionally lucky now to have so many options available to us, especially with the ease and availability of kitchen sinks online. With the increase in the Modern Luxe look, we are always looking for ways and ideas to make our homes our sanctuary. We no longer must go and stay in an expensive hotel to experience a gorgeous marble kitchen or bathroom. 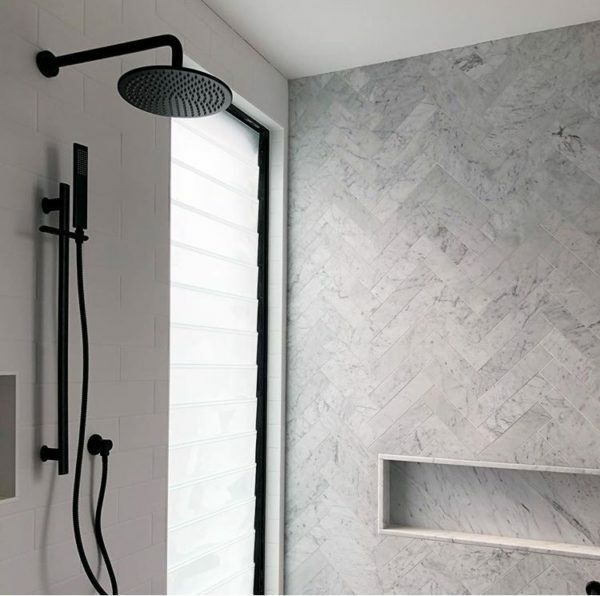 And with an increase in the amount of Renovation and DIY shows, we tend to be able to afford to spend more on fixtures and fittings, instead of labour. 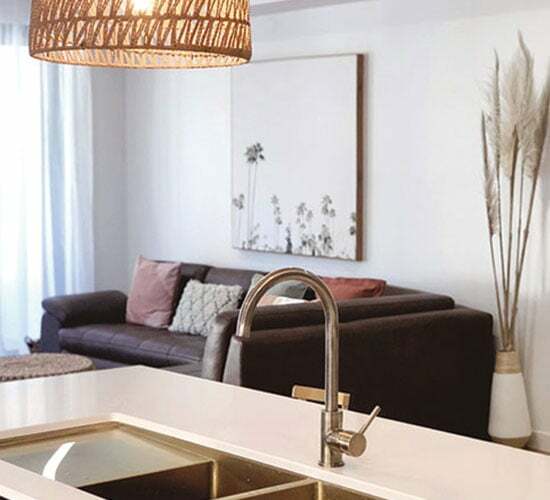 The seamless look is achieved by using an undermount kitchen sink, this gives the feeling of flow on the benchtop and makes cleaning around your sink a breeze. Complete your look with curvy, shiny, golden fixtures and you won’t want to leave your kitchen ever again! If you have decided to revamp or design your new kitchen, start off with looking at kitchen sinks online. This will save you so much time upfront. Many of the online suppliers can now mail you samples of the materials you are looking at, this helps to give you the confidence and reassurance to support your final choice. If you have found something online and you have a local supplier, pop in to their showroom if possible, and look at the actual products, as this will give you a true indication of the colour, texture and feel. Gone are the days when we only looked for function from our kitchen sinks, now we can have beauty and function. So which style suits you? Modern Luxe, Classic, Country Farmhouse…what does your kitchen sink say about your style?